Your Bulimia Recovery – What do you need the most help with now? BlogHome » Blog » Eating Disorders » Your Bulimia Recovery – What do you need the most help with now? I want to open up the discussion of bulimia recovery to your comments and questions with this post. I was having a conversation with my friend Maira today who’s a wonderful life coach and eating disorder therapist. As we talked about a bulimia recovery mentorship program we’re developing we asked each other what we felt were the most important factors someone who’s got one foot in recovery and one foot in their eating disorder could benefit from the most. If we only had a month to teach you some really powerful stuff to get you over the mountain and into the lasting recovery camp, what would we teach? I shared with her my post exploring the best tool, technique, skill, practice, support or treatment that helped you overcome bulimia the most. I certainly don’t claim to have all of the answers. I’ve never been through an in-patient bulimia treatment program, I only worked with a therapist for a short period and support groups like Overeaters Anonymous were helpful to me, but never really gave me the gift of lasting recovery. What I have come to learn about bulimia recovery from reading many, many stories, books on eating disorders and studying insights from experts is that our recovery journey is unique to each of us. As Maira and I talked today I shared with her how passionate I am about the importance of learning to face whatever cripples you (face your feelings). In my case it was usually work stress. I shared that making a firm decision (or commitment to recovery) that you could not go on living with bulimia was a turning point that created the lasting change for me. We talked about the importance of self-love, but self-love is often a step you take after many smaller steps (i.e. reaching for self-love immediately after you start your recovery journey could be too great a leap to make and getting to self-acceptance is a good interim step). I share all this because all I really want to do is be a contribution to you through this bulimia recovery mentorship program. I think hearing from you about what you want the most help with now is important for us in understanding how we may be able to help. If you could please take a few minutes, or more if you have it, to share in the comments below what you’re working on right now – or what you’ve learned a little about but want to deepen – it would be a big help. 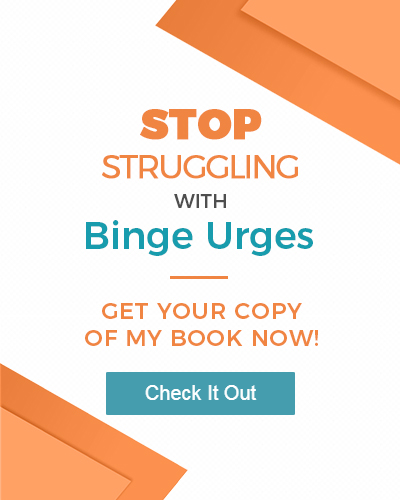 What is it that keeps tripping you up and launching you back into a binge? What do you think keeps that fear that you might binge again lingering in the back of your mind? And can you tell me your big WHY? WHY do you want lasting recovery? What do you think you’ll gain in your life as a result of being a non-bulimic? Please don’t be ashamed or afraid to post. Instead I ask you to be courageous here. You will be helping both me and many other women who may be too afraid to post below by responding. If you’re more comfortable communicating with me by email, please use my contact form and I’ll be emailed your response. Being of service to you would mean the world to me. I know how dark it seems each day when you’re living with bulimia. If you haven’t read my bulimia story, I hope you will so you’ll know that I’ve been where you are. What do you think keeps that fear that you might binge again lingering in the back of your mind? That i have been determined not to do it so many times, a 15+year history of doing some terrible things that I thought would make me turn the corner and they haven’t, of trying everything but still failing. I’m scared I may not be as successful as i imagine i would be without it- it gives me a reason for not doing x, y and z.
next post: How Do I Help a Friend With an Eating Disorder?